As defined by the United States Environmental Agency, "Sustainability is based on a simple principle: Everything that we need for our survival and well-being depends, either directly or indirectly, on our natural environment. Sustainability creates and maintains the conditions under which humans and nature can exist in productive harmony that permits fulfilling the social, economic and other requirements of present and future generations." "Efforts today benefiting future generations" is the ethos of the sustainability dialogue with scenarios of future beneficiaries. Yet unlike convoluted Terminator time-loops, those beneficiaries have little to no influence on their (future) inherited circumstances. But one of the biggest changes to sustainability issues is that opportunities to act sustainably, and affect the here and now, have become more and more accessible. First the availability of goods and services, from companies who use sustainability practices in the procurement, manufacturing and distribution, has increased. Secondly while eco-friendly and organic products typically retain a price premium the gap is narrowing. If you have young children or about to have you, it's likely you know about Honest, the ecommerce eco-friendly baby supplies company co-founded by actor Jessica Alba and entrepreneur Brian Lee. Customers sign up for monthly deliveries of decorated diapers as well as sundries using in-house formulas that reduce chemicals. Babies as the end-users of eco-friendly sustainable products closes the loop by benefiting them now... and in the future. Well, at least we can verify this with their parents. Parents to newborns are shocked by the amount of stuff needed to care for them. Water consumption goes up drastically with baths and laundry as well as refuse. Also parents quickly become aware that diapers produce by far the most amount of waste in relations to child rearing. Research conducted by Anne Link in 2003, "Disposable nappies: a case study in waste prevention" reported that up to 50% of the waste is disposal diapers. On the other side of the Atlantic in Switzerland, Gabrielle Lods took a different track to the diaper conundrum when she started the Sustain a Bum project to reduce diaper waste. Sustain a Bum, now an ecommerce business, mixes a commitment to mission with a catchy name while grappling with the realities of the business world. Ms. Lods understands that diapers must appeal to the fashion senses of purchaser not the end-user and so Sustain a Bum diapers come in over 40 patterns. Sizing and manufacturing are streamlined with a one-size-fits-all offering for children between 8 weeks and 2.5 years. She also points out that using them for your child will prevent one ton of waste of disposable diapers and use 20 times less raw materials such as crude oil and wood pulp than disposable. Their manufacture amounts to 2.3 times more water than cloth (including the washing). (Armstrong, Liz and Adrienne Scott Whitewash: Exposing the Health and Environmental Dangers of Women's Sanitary Products and Disposable Diapers, What You Can Do About It. 1993. HarperCollins) Disposables also take approximately 500 years to decompose in landfills or oceans. The biggest apprehension for potential purchasers of Sustain a Bum diapers is, "Do you expect me to put solids/ poo in my washing machine?". 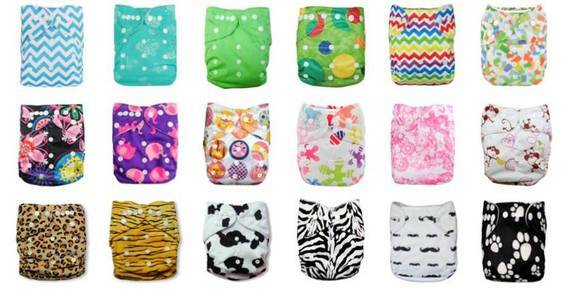 The diaper is designed uses a woven textile liner placed between the baby's bottom and the cloth diaper. Thus the solids are disposed of in the toilet, not the washer. Another challenge is getting parents to think about diapers as health and sanitary baby equipment. Especially when you think about how much contact and how long a baby /young child is in diapers. Several analyses have shown that a disposable diaper can contain over 50 chemical compounds. They are essentially made of wood pulp used for sanitary products like female hygiene and diapers that can be bleached with chlorine leading to traces of dioxin. Molecules of dioxin (classified as cancerous by the WHO) are stored mainly in fat cells and can remain there up to 30 years. Also on average, the temperature in the disposable diaper is one degree Celsius higher than in cloth diapers (38°C) which could be affecting the testicles development and fertility. Finally, there is the savings. Based on their calculations using Sustain a Bum diapers saves money as only 15-20 are necessary versus the 5'500 used on average by a child for 2 and half years. Disposable diapers costs amount to an average of $1'600 USD versus and average of $600 USD for disposables (including cloth diapers purchase, detergent, water, electricity and washing machine depreciation) saving 1'000 USD per child. Also a currently running Sustain a Bum survey shows that babies wearing cloth diapers are potty trained up to 12 months faster on average. To date Sustain a Bum has saved over 250'000 disposable diapers purchases for their customers (and the landfills). In the sustainability diaper universe, Ms. Lods' Sustain a Bum business is a back to the future approach.